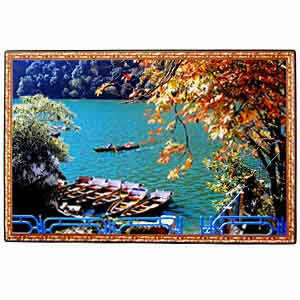 This is a beautiful view of the Nainital Lake fringed by lofty mountains. The lake provides a pristine look of nature and unending expense of scenic beauty. A look at this wall picture can take you to a world of romance and act as a reliever of stress. Your loved ones in all cities in India will thoroughly love this. Make the occasion of your dear ones, even more special. Send other exclusive Gifts across India to your loved ones, safely and securely through GiftsAcrossIndia.com.